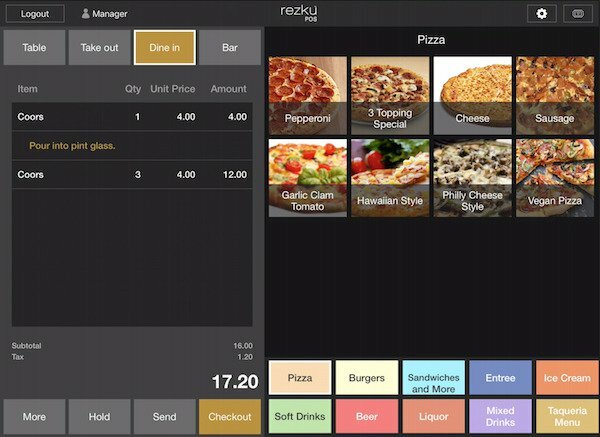 In Rezku POS, you take orders in the New Order screen. After unlocking the register with your employee PIN, you’re ready to take an order. First, choose the service-type for your guest by tapping one of the options in the bar above the order. Table Service - When you’re serving guests seated at multiple tables in a full-service restaurant. Use the floor plan built into Rezku POS to keep track of your guests and their orders. Take Out, Dine In, Bar, Delivery - When guests are receiving quick-service, fast casual, taking a delivery or are seated in the Bar. This service does not utilize the floor plan. It’s important to understand how your restaurant’s menu is organized. 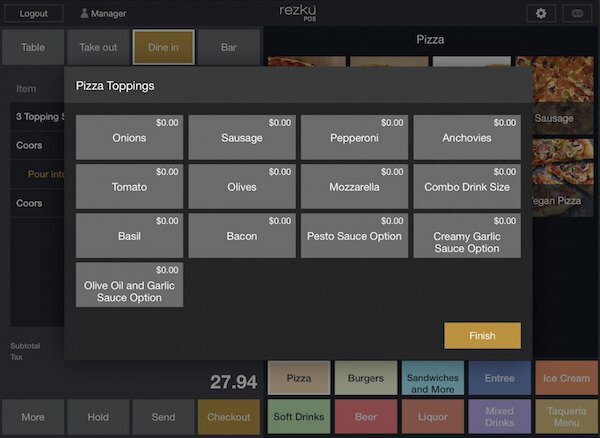 A well-organized menu will have products grouped in a logical way, to help orders flow smoothly. 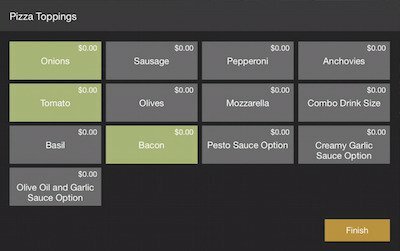 Take some time, in the beginning, to navigate your restaurant’s menu and see how it’s built. Practice where to find specific items. 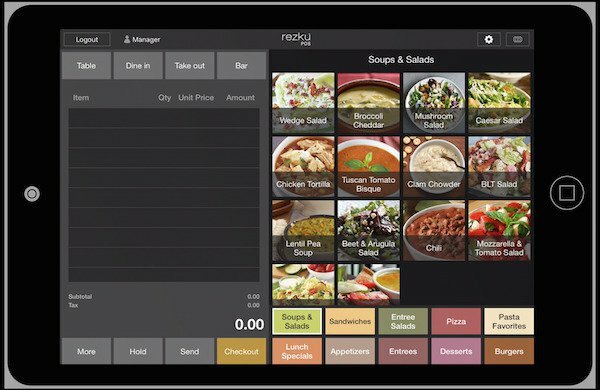 It will come to you quickly but taking time to learn your restaurant’s menu will increase order accuracy when managing the stress of a busy service. When you start a new order, the bottom two rows of the New Order screen show you the main categories for items on your menu. The area above, with larger tiles shows you individual products on the selected menu. 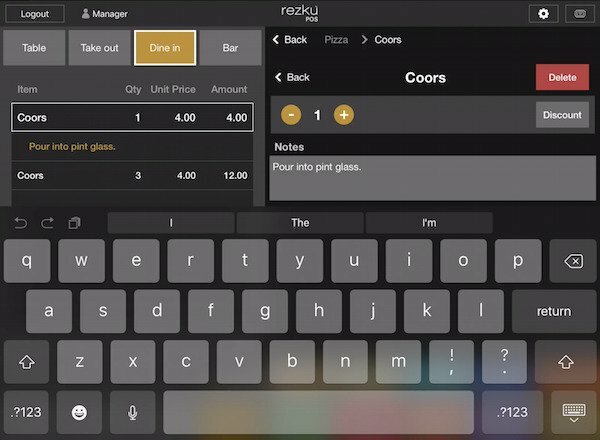 For example, tap the Beer menu to view the beers your restaurant serves. 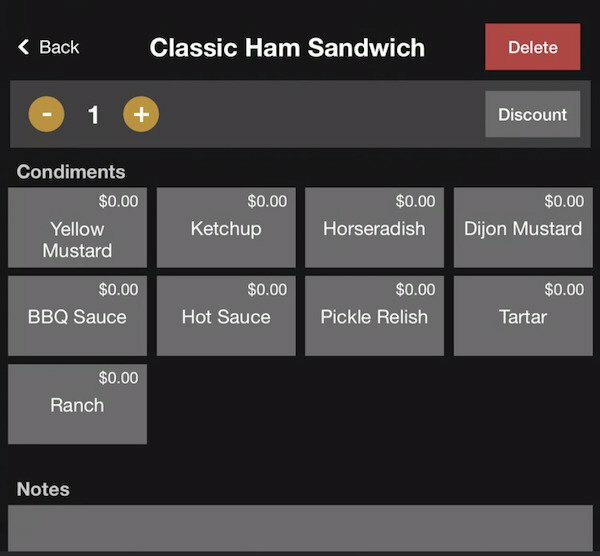 Keep in mind that your New Order screen will have different items, based on your restaurant’s menu. 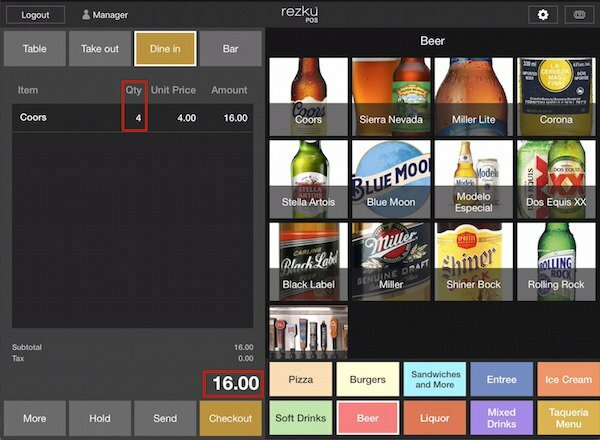 ● To order a beer, just tap the one you want. One beer appears under Item in the order. To increase the quantity of the item ordered, tap it again. The quantity increases with each tap. You can see it increase in the Qty column, along with the total. Taking orders is fast and simple! Now tap the item to view the Item Details. The details view gives you additional options for the item you’ve tapped on. To add notes to this item, tap on the notes box and begin typing. In this example, the guest wants a glass instead of a bottle. Tap the Edit One button, and type notes for the selected item. Notes appear in gold, under the item. For items that have modifiers, they appear in Item Details. Modifiers allow guests to have more choices. Modifiers are set up in Rezku POS Back Office. Unforced Modifiers - Allow you to provide optional options but are not required. These appear when viewing the Item Details. Forced Modifiers - Require the selection of at least one of the modifiers. 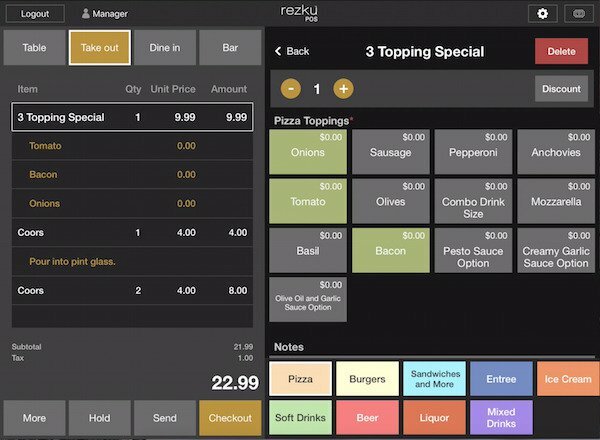 In this example, the guest wants to order the 3 Topping Special, which has forced modifiers. The guest must choose a topping for their pizza. This window can not be closed until a selection is made. ● Tap to select. Tiles turn green to indicate selection. ● Tap again to change the selection. ● Tap the gold Finish button to complete selection. If your product has multiple forced modifiers the Finish button will say Next. Modifier Options allow you to change the type or quantity of a modifier. The Pizza offers a Combo Drink special that uses modifier options to specify the drink size. To add a Combo Drink to the guest’s order, tap the Combo Drink Size tile. A submenu appears to pick the drink size. Just tap on the size your guest wants. 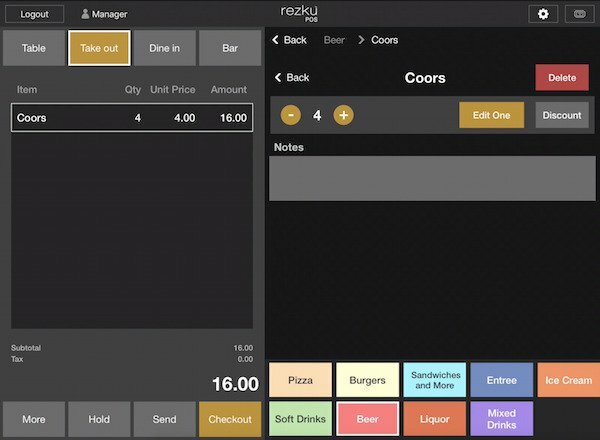 The order total adjusts based on the price of each drink size automatically. 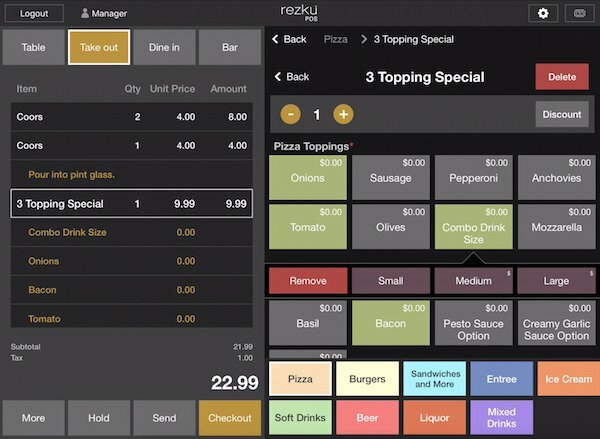 To add more items to your guest’s order, tap the menu tile for the next item.